François Ozon’s delicious new drama is a smart and sly satire – with some jaw-dropping twists – about gender, class and consumerism. To reveal anything about the ravishing, unexpected twist in the latest of François Ozon’s audacious, elegant and witty melodramas would do both the film and its audience a significant disservice. So there is good reason to draw on reference here. Envisage a gloriously conceived, sublimely realised amalgam of the seething, flamboyant cinema of Douglas Sirk and the razor-sharp writing of Christopher Isherwood, and be sure that Ozon will have surpassed your wildest imaginings. 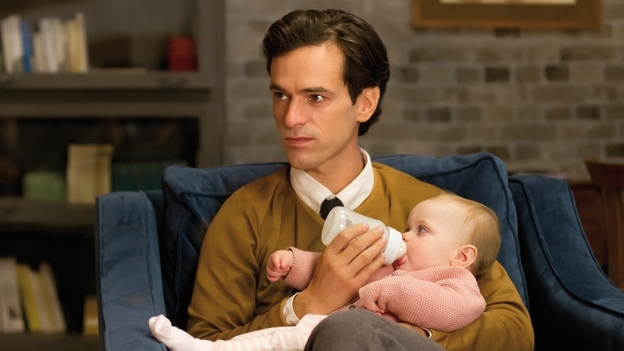 Claire (Anaïs Demoustier), devastated by the death of her best friend, makes a promise to watch over her husband (Romain Duris) and newborn child. Battling through a fog of depression and a lack of responsiveness from her own husband, she reluctantly drags herself to the plush suburban home of her friend’s widower only to make a startling discovery about the form his grief has taken. At first shocked and resistant, then progressively seduced, she ultimately finds expression for her own crippling anguish and repressed desires. Demoustier and Duris give superb performances, perfectly attuned to the film’s pointed observations about gender, class and consumerism while conspiring with Ozon to paint a thick layer of normalcy over the disruptive, deliciously subversive story.